THIS PAGE WAS UPDATED APRIL 15, 2011, TO REFLECT A SIGNIFICANT CHANGE IN STS-135 MINI-LABORATORY OPERATION. THIS PAGE NOW FULLY DESCRIBES MINI-LAB OPERATION FOR SSEP ON STS-135. ALL STUDENT TEAMS AND TEACHER FACILITATORS ARE URGED TO READ THIS PAGE CAREFULLY AND ADJUST THEIR EXPERIMENT DESIGN THINKING IF NEEDED. GROUND TRUTH EXPERIMENTS NOW TAKE ON AN EVEN GREATER ROLE IN EXPERIMENT DESIGN, AND THEIR IMPORTANCE IS DESCRIBED BELOW. April 15, 2011, IMPORTANT UPDATE: The Mini-Laboratory used for STS-135 is the same as used for STS-134—the Materials Dispersion Apparatus (MDA). However, there was to be one essential operational difference. For STS-135 student teams were to be able to add a third experiment sample (a fluid and/or solid) before the shuttle leaves orbit. This would have provided a team the ability to shut down a biological experiment, before gravity is reintroduced to the experiment, by adding a “biological inhibitor” or “fixative”. This capability was described in the Microgravity Experiment Case Studies and Fixative and Growth Inhibitors documents found in the Document Library. On April 12, 2011, NCESSE learned that due to the compressed launch schedule, with a launch date targeted for June 28, 2011, only a single mini-lab could be flown and that it had to be shared by both SSEP student experiments and the professional research experiments. (This is actually a teachable moment, reflecting how compromises have to be made when many researchers need to use a limited research resource, and yes … the students participating in SSEP are definitely considered researchers.) Very significant conversations between NCESSE, NanoRacks, and ITA quickly led to the conclusion that the SSEP slide protocol would not work for the professional researchers, yet the slide protocol for the professional researchers would still work for SSEP. It is the slide protocol that was used for STS-134, and which successfully saw 447 student team proposals and 16 selected to fly on Endeavour. It was clear that mini-lab operation on STS-135 would need to be identical to mini-lab operation on STS 134. This means that mixing a third sample many days into the mission is no longer possible, and only two Experiment Slots are available for STS-135: Type 1 and Type 2-Prime. The information below now fully decribes mini-lab operation on STS-135. All Student Teams and Teacher Facilitators are urged to read this page carefully and adjust their experiment design thinking. This page provides all the information you need regarding the mini-laboratory used for SSEP experiments on STS-135—the Materials Dispersion Apparatus (MDA). Here you will find all the specifications for the mini-lab into which your experiment will be placed, including its straightforward operation, and all the constraints on your experimental design. But before reading this page, be sure to read the Designing the Flight Experiment page. It will help you understand how to start thinking about a possible experiment. The MDA is in concept a very simple mini-laboratory that is flight-ready, and has a rich heritage of conducting experiments—including student experiments—aboard the Space Shuttle, sounding rockets, and the Russian Mir Space Station. The MDA is designed to carry small samples of fluids and solids—the Experiment Samples—in what are the equivalent of small test tubes, and provides for the samples to be mixed at an appropriate time, e.g., once the Space Shuttle enters orbit, to assess the effects of microgravity. The MDA is about the size of a brick (see Figures 1 and 2), and can contain 50 to 120 separate slots for experiments. For the CREST-DreamUp mission on STS-135 the MDA will utilize approximately 90 Experiment Slots, supporting 90 separate experiments, including experiments by professional researchers, college undergrad and graduate students, and through the SSEP, students in grades 5-12. All of the student experiments will be carried in a single MDA mini-lab, which will be placed in a mid-deck locker aboard Space Shuttle Atlantis. Each Experiment Slot consists of two blocks—an upper block and a lower block—that can slide relative to one another, which is illustrated in Figure 3 for the Type 2-Prime Experiment Slot, one of two types available for student use. The blocks are made of an inert polymer. Cylindrical cavities in both upper and lower blocks—the Sample Wells—are designed to carry your experiment samples (fluids and/or solids). They can be thought of as miniature test tubes. Once samples are loaded into the Wells, sliding the blocks appropriately allows the Wells to be aligned and samples to be combined. A thin layer of sealing compound between the blocks serves as a seal—an integral part of a first level of containment—to help ensure that the sample materials are not introduced into the crew cabin. The aircraft aluminum housing for the entire MDA provides a second, redundant level of containment, which is required for flight certification. The entire mini-lab is then placed in a sealed sleeve to provide a third level of containment. Type 2-Prime: as shown in Figure 3, the Type 2-Prime has 2 Wells total: 1 in the upper block and 1 in the lower block. The Type 2-Prime allows 2 sample materials to be combined. Type 1: as shown in Figure 4, the Type 1 Experiment Slot provides a single Well in the lower block, for experiments that do not require mixing of sample materials. It is a “blind” Well, that is unaffected by the motion of the blocks. 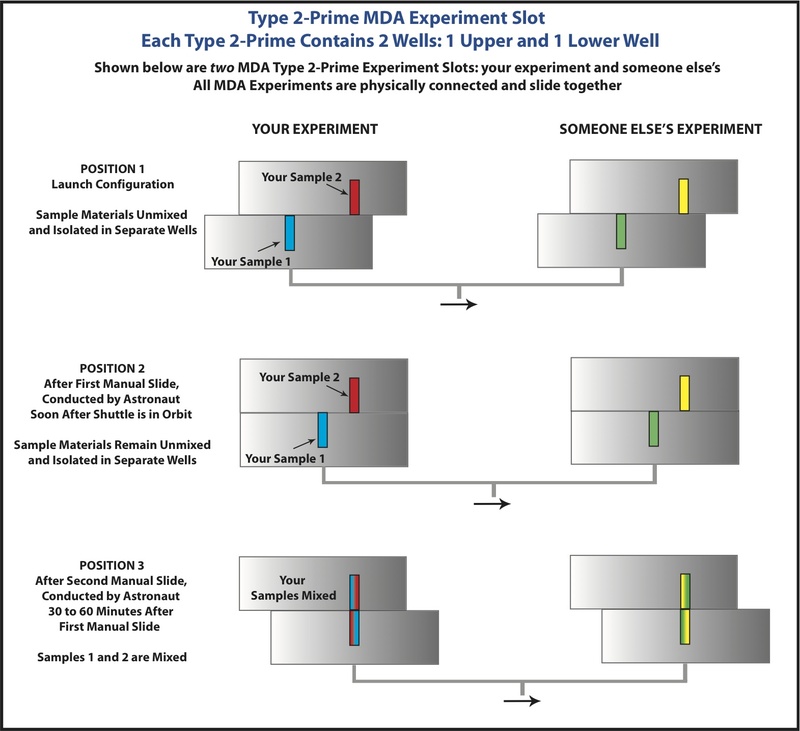 The MDA’s 90 Experiment Slots include both Type 1 and Type 2-Prime Experiment Slots. The 90 Experimental Slots DO NOT operate independently. 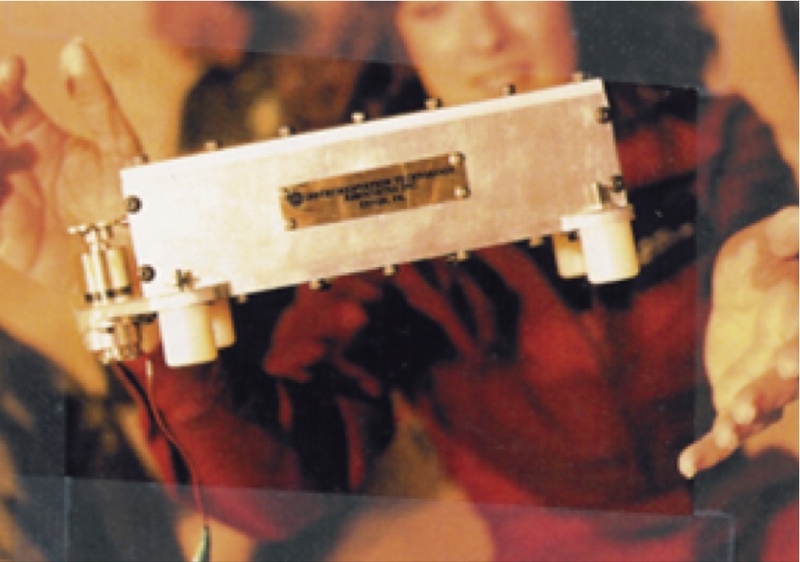 The MDA has an external hand crank operated by the astronaut (see Figure 2), and turning it slides the blocks in all 90 Experiment Slots simultaneously and by the same amount. This is shown in Figure 3 which shows two Type 2-Prime slots connected and sliding together. One of them is your experiment and the other is someone else’s experiment. For the STS-135 flight, we have defined a Slide Protocol consisting of 2 slides. 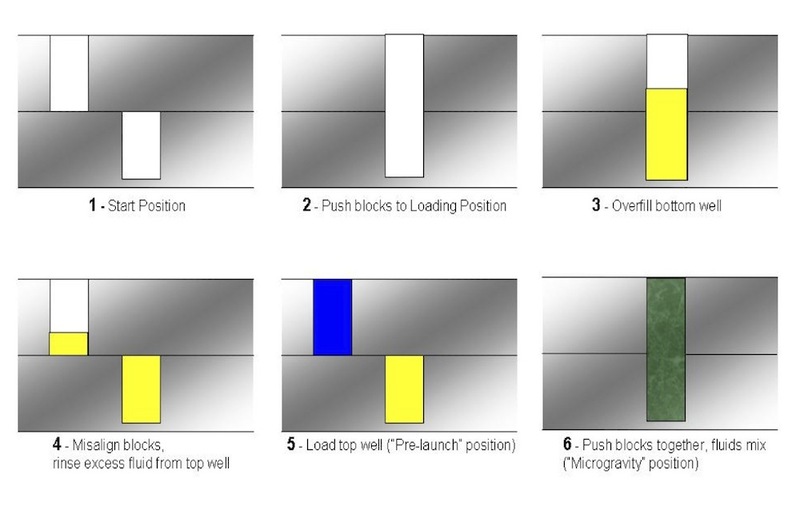 Position 1, the Launch Configuration, has the Wells in the blocks misaligned so that no samples can mix. Soon after the Space Shuttle reaches orbit, an astronaut will carry out the first slide by turning the hand crank to Position 2. But this does not yet combine samples in a Type 2-Prime Slot. Then, just 30 to 60 minutes after the first slide, an astronaut will carry out the second and final slide by turning the hand crank to Position 3. This will combine Samples 1 and 2 in the Type 2-Prime Slot. It is important to note that your samples will remain combined until the Space Shuttle lands 12 days later. With the slide protocol adopted, the Type 2-Prime Experiment Slot is meant to start an experiment once the Shuttle reaches orbit and microgravity is achieved. This is done when the astronaut slides the blocks for the second time and the samples are mixed. Type 2-Prime Example: The Type 2-Prime provides an excellent protocol for a significant class of biological experiments. After the wells are brought together, an organism, e.g., a Planaria flatworm might be exposed to a bacterium as an infectious agent, or a sample of living tissue (e.g., cartilage) might be exposed to a growth medium. A Type 2-Prime Experiment Slot is perfectly suited for an experiment exploring how a seed will germinate in microgravity. The dry seed or seeds can be loaded into the lower Well with a little cotton, and a nutrient solution loaded in the upper Well. The wells are brought together once in orbit, and the 12 days in space provides a good timeline for germination. But be sure to match germination and growth times to the 12-day mission duration. The Type 1 Experiment Slot provides a self-contained microgravity environment for an experiment that is ‘pre-loaded’ before launch, and requires no addition of sample materials once in orbit. Type 1 Example: A liquid medium containing a Planaria worm with a portion cut off might be placed within a Type 1 Well to assess regeneration in microgravity. In this case, there is no need to add sample materials in space, and the worm could be loaded close to launch as well. 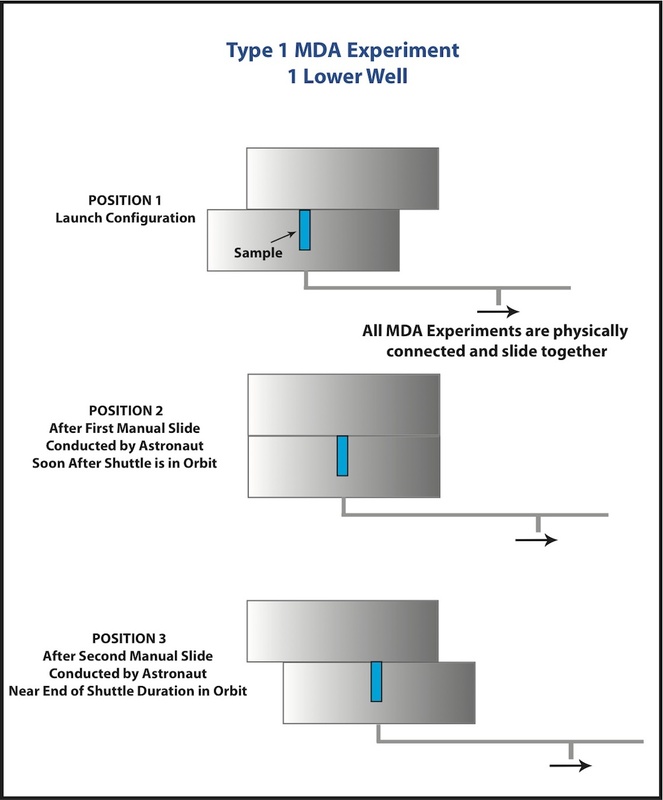 Figure 5 provides the protocol for loading samples into the Wells of a MDA. A key way to address your flight experiment’s exposure to gravity is to conduct the same experiment on the ground—a “ground truth” experiment—or many of them to get an average result, while your experiment is flying aboard the Shuttle. The ground truth experiment(s) will yield results with gravity present throughout the duration of the experiment. By comparing the ground truth results to the results of your flight experiment, you can look for the effects of 12 days of microgravity. The fluids and solid materials you use as your experiment samples must pass a NASA Flight Safety Review (a Review by NASA Toxicology) to ensure the experiment poses no hazard to the crew and Shuttle in space. Remember that the MDA will be in a locker in the crew cabin of the Shuttle. To this end, student experiments will only be able to make use of fluids and solids listed on the Master List of Experiment Samples. OF CRITICAL IMPORTANCE: The Master List of Experiment Samples includes a list of samples that have previously flown in the MDA and other similar mini-labs designed, constructed, and operated by Instrumentation Technology Associates (ITA), and have therefore passed prior flight safety reviews. The Master List also includes additional non-toxic samples, and non-toxic categories such as “various vegetable seeds”. Use of samples on this list ensures a very high probability of passing review. Note: due to the compressed launch schedule for STS-135, NASA has already looked at the entire Master List, and has stated that there should be no problem with an experiment passing flight safety review if experimenters use what is on the list. The Master List of Experiment Samples for STS-135 is found in the Document Library. Proposals for student experiments using samples that are not on the Master List will be rejected. This may seem rather restrictive, but there are two very large benefits to this approach: 1) using the samples on this list means there is a very high probability that your experiment will pass flight safety review (NASA Toxicology review) since the list contains either samples that have passed prior review, or are so non-toxic that they impose no obvious threat, and 2) given the limited time for experiment design before proposals are due, the Master List provides student teams a manageable place to start noodling around ideas about possible experiments, e.g., start by researching the samples on the list and explore their relevance to microgravity research. Note, however, that while the previously flown samples and the added non-toxic samples have a very high probability of passing flight safety review by NASA toxicology, the final decision is NASA’s and out of the control of NCESSE, NanoRacks, and ITA. As a good benchmark, all 16 SSEP experiments selected for flight on STS-134 passed NASA flight safety review. The MDA is a mini-laboratory, which means Well volumes for experimental samples are small. So be sure you design an experiment with the specifications below in mind. For instance, if you are exploring seed germination, make sure your seeds comfortably fit inside the well. For more very valuable information see the MDA Well Sizes—How Big are the Test Tubes? document in the Document Library. For liquids, the Wells are always filled to 100% capacity; it is up to the experimenter to determine the percentage of a Well to be filled with a solid. You will need to provide your experiment samples by Launch minus 10 Days to Launch minus 6 Days if the samples are not time sensitive. If the samples are time sensitive, e.g., they contain living organisms, we will work with you to try receive samples by Launch minus 3 Days, and see if they can be loaded as late as possible before the payload is turned over to NASA at likely Launch minus 2 Days. It’s also important to recognize that time critical professional scientific research also flying in the same MDA as the SSEP experiments will be loaded last. Please see the STS-135 Critical Timeline page for milestones on the loading of experiment samples. It is reasonable to expect that all MDA samples will be harvested within 24 hours after NASA turns the payload over to us (less than 30 hours after Shuttle landing). Depending on the student science to be performed, it may be possible to harvest your samples 12 to 18 hours after the payload is turned over to us, however, the professional research experiments will have harvest priority. If the Shuttle is diverted to its landing site in California, e.g., Edwards Air Force Base, NASA will provide us the payload (with student experiments) at the landing site, and we will work with NASA to get the payload on a NASA aircraft that will be flying from Edwards Air Force Base to Kennedy Space Center. However, this could delay the start of the harvesting process from 12 to 36 hours. We’ll harvest the experiment samples at Kennedy Space Center, and can either turn over the samples to student team representatives at Kennedy, or overnight the samples to your school via FedEx. Please see the STS-135 Critical Timeline page for milestones for the harvesting of experiment samples. 1) The Block serves as an exceptional experiment design tool, providing students and teachers a critical understanding of the volumes and dimensions of the experiment wells (the small test tubes) in the Materials Dispersion Apparatus (MDA) mini-lab that is used for SSEP experiments. The Block provides a concrete understanding of the volumes and dimensions of the fluids and solids that must be used in an experiment. 2) The Block allows test-bed versions of a proposed experiment to be conducted and assessed before a proposal is submitted. 3) During the flight, the Block can be used as a low cost means of conducting concurrent ground truth experiments. The MDA Experiment Design and Ground Truth Block is made of clear lucite, and contains 16 wells with the same dimensions as the wells in the Materials Dispersion Apparatus (MDA) mini-lab. Each of eight wells in one row represents the lower well of a Type 2-Prime Experiment Slot (or equivalently, the single well of Type 1 Experiment Slot.) Each of eight wells in a second row are twice the depth, and represent the total volume when the upper and lower wells of a Type 2-Prime Experiment Slot are brought together. The large number of wells allows multiple experiments by different teams to be conducted at the same time, or a single team to conduct different versions of their experiment to, e.g., try different concentrations of a fluid and/or solid during the experiment design phase, or refinement of an experiment selected for flight. The MDA Experiment Design and Ground Truth Block requires the experimenter to mix samples via, e.g., pipette, and tape a cover slip on top of the well to seal the experiment. If your community has more than one school participating in the program, it is strongly recommended that you obtain more than one Block. Experiments in a great number of science disciplines have been conducted in microgravity using the MDA, including protein crystal growth, inorganic crystal growth, cell biology, botany (e.g., seed germination), physiology of microorganisms, food studies, studies of micro-aquatic life (e.g., Planaria Worms), fluid diffusion, and micro-encapsulation of drugs. For a comprehensive overview of microgravity experiments across nine science disciplines see the Microgravity Science Background document in the Document Library. For an extensive list of experiments relevant to the MDA, and that have been conducted in the MDA, see the Microgravity Experiment Case Studies document in the Document Library. Make sure to read the Designing the Flight Experiment page for how to think about framing an experiment, and an overview of the science that might be explored in microgravity. Make sure to read about the suite of Teacher and Student Resources. Make sure to get very familiar with the STS-135 Critical Timeline, and information on the student team proposal process on the Flight Experiment Design Competition page.